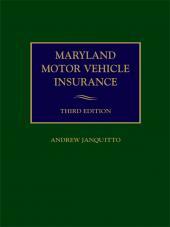 Convenient and authoritative reference that helps you understand the technical aspects of accident reconstruction in the context of admissibility. When the time comes for a judge or jury to render a verdict in a lawsuit, rarely is there sufficient objective scene data or eye witness testimony to help them determine what happened in the critically deciding seconds of a crash. The purpose of motor vehicle accident reconstruction is to determine what happened at a particular point in time in accidents with respect to drivers, vehicles, objects, pedestrians and others. 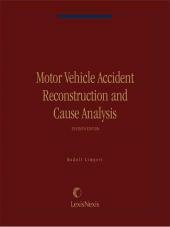 The Seventh Edition of Motor Vehicle Accident Reconstruction and Cause Analysis provides the novice or experienced attorney, expert witness, and investigator with fundamentals necessary to properly formulate a case, collect critical data, and apply proven engineering concepts in the reconstruction and cause analysis of accidents. 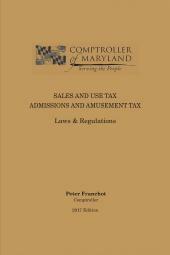 The revisions and additions in the Seventh Edition include numerous chapter review questions, hints for expert testimony and report writing, and guidance on when to retain an expert. There are also discussions of case formulation errors and how costly mistakes can be avoided, as well as many MARC1 software applications and analysis of actual crashes, along with a discussion of how a successful resolution of a particular case is most likely to be achieved. The new looseleaf binder design allows the Seventh Edition to become a living document, both in terms of personal use as well as future supplements. 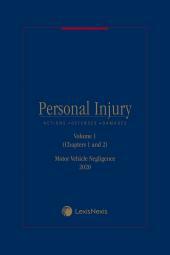 Readers using MARC1 Accident Reconstruction Software in their forensic praxis will find the Seventh Edition a helpful tool in effectively using MARC1. MARC1 software applications have been added to make the analysis of complicated calculations an easy and efficient task. The novice lawyer and the expert working his or her first traffic case or the "old pro" will benefit greatly from the experience gained by the author in nearly 350 trial testimonies, 800 depositions, and over 3,000 accident reconstructions. Dr. Rudolf Limpert has had a long and successful career as consulting engineer on motor vehicle and traffic safety. The success of his consulting career finds its source in his German apprenticeship program as automobile and Diesel truck mechanic over 60 years ago. While also studying at night, he received his journeyman and associated mechanical engineering degrees at the same time three years later. Two years later Dr. Limpert graduated with a bachelors degree in mechanical engineering with emphasis on design and manufacturing. In the German industry, he designed fork lifts and cranes as well as worked as manufacturing engineer. While working as brake system design engineer for a large German brake manufacturer, he realized an important limitation in his education: While having an excellent practical experience and knowledge of things mechanical, the theoretical aspects, for example, in analyzing brake temperature or vehicle dynamic stability, were entirely beyond the boundaries of his practical knowledge. Immigrating to the U.S. in 1965, and nearly seven years later, Dr. Limpert had received his bachelors and masters degree from Brigham Young University and Ph.D.in mechanical engineering from the University of Michigan. While working as safety standards engineer for NHTSA in pre-crash safety, the vice-president for research at the University of Utah asked Dr. Limpert to direct the multi-disciplinary accident investigation team at the University of Utah. 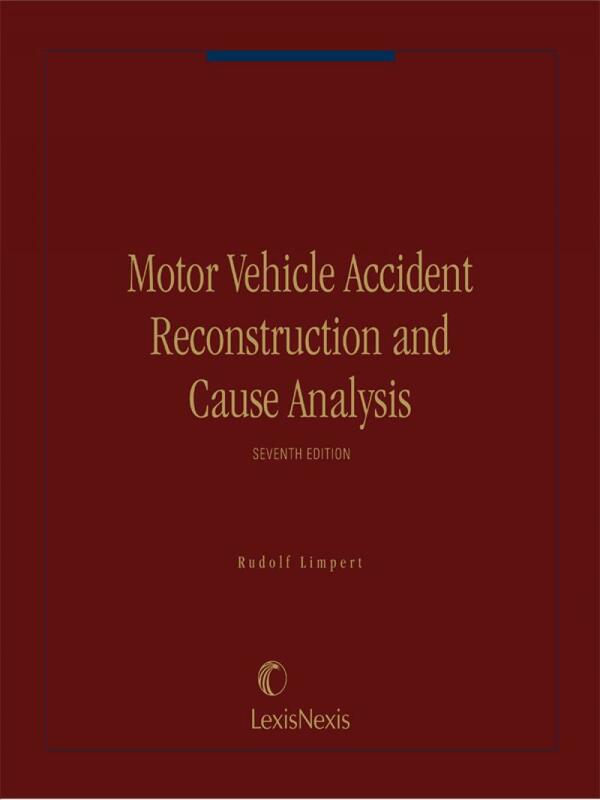 Dr. Limpert accepted the position, and nearly 3,500 crash investigations, over 300 trial testimonies and 800 depositions, and innumerable lawyer-case formulations as well as teaching thousands of engineers, experts, police officers and lawyers later, the Seventh Edition of Motor Vehicle Accident Reconstruction and Cause Analysis embodies Dr. Limperts professional life experience and writing motto: From the practical to the theoretical. When experts and lawyers understand and use this simple concept, juries and judges will thank you for it.